1 Universidad Nacional Autónoma de México. Facultad de Estudios Superiores Zaragoza. Unidad de Investigación en Sistemática Vegetal y Suelo, Ciudad de México, México. The host´s structural characteristics provide diverse microhabitats that influence the distribution patterns of the epiphytes at different vertical zones and among tree species. Epiphytic orchids have preference for larger host trees and with non-exfoliating rough bark, while the limiting hosts will be those of smaller size and smooth and exfoliating bark, and there will be fewer individuals in the upper canopy of the host trees, because the micro-environmental conditions are more stressful compared to the middle and lower parts of the host trees. The host preferences and vertical distribution of the epiphytic orchids were analyzed in 20 montane cloud forest fragments. In each fragment, two transects of 2 × 50 m were drawn, and the trees with a diameter at a breast height ≥ 20 cm were recorded. In each tree, basal area was quantified and bark texture was characterized. In each tree and vertical zone, the orchid species present were identified and quantified. Orchid distribution patterns vary between vertical zones and host tree species, and the richness is related to host size and bark texture. The highest species richness and number of epiphytic orchid’s individuals were recorded in host trees with fissured bark and larger size. The distribution of orchids in the host was not homogeneous nor was it related to any particular host species. However, five trees species were considered as host preferred, while five tree species were limiting hosts. The highest richness was recorded in vertical zone II and the lowest in zones I and V.
Larger trees contain greater richness of epiphytic orchids, because they offer better conditions for their establishment, provide a great diversity of microhabitats, greater time and area for epiphytic colonization events. The texture of the bark is a relevant factor in the host preference, and in the hosts with smooth bark, the presence of epiphytic orchids depends on the accumulation of organic matter. Las características estructurales del hospedero proporcionan diversos microhábitats que influyen en los patrones de distribución de las epífitas en diferentes zonas verticales y entre especies de hospederos. Las orquídeas epífitas tienen preferencia por árboles hospederos más grandes y corteza rugosa no exfoliante, mientras que los hospederos limitantes serán los de tamaño más pequeño con corteza lisa y exfoliante, además, habrá menos individuos en el dosel superior de los mismos, debido a que las condiciones del microhábitat son más estresantes, en comparación con las partes media e inferior de los hospederos. Se analizaron las afinidades por hospederos y la distribución vertical de orquídeas epífitas en 20 fragmentos de bosque mesófilo de montaña. En cada fragmento se trazaron dos transectos de 2 × 50 m, y se registraron los árboles con diámetro a la altura del pecho ≥ 20 cm. En cada árbol se cuantificó el área basal y se registró la textura de la corteza. En todos los hospederos y en cada zona vertical del árbol se identificaron y cuantificaron las especies de orquídeas. La riqueza de orquídeas varía entre zonas y especies de hospederos, y está relacionada con el tamaño de los mismos y la textura de la corteza. La mayor riqueza de orquídeas se registró en hospederos de mayor tamaño, con corteza fisurada. Las orquídeas no se distribuyen en una especie particular de hospedero. Se registraron cinco especies como hospederos preferentes y otras cinco como limitantes. La mayor riqueza de orquídeas se registró en la zona II y la menor en las zonas I y V.
Los árboles de mayor tamaño registraron una riqueza más alta de orquídeas epífitas, debido a que proporcionan mayor diversidad de microhábitats, más tiempo y área para los eventos de colonización de este tipo de plantas. La textura de la corteza es un factor determinante en la preferencia de hospedero, en aquellos con corteza lisa la presencia de orquídeas epífitas depende de la acumulación de materia orgánica. Vascular epiphytes are one of the most diverse groups of plants in humid tropical and subtropical forests (Gentry & Dodson 1987). The compiled list by Zotz (2013) comprises 28,000 vascular epiphytes species included in 73 families and 912 genera recorded globally, of which Orchidaceae is the most diverse, with approximately 19,000 epiphytic species in 543 genera; nearly 70 % of this family is epiphyte (Chase et al. 2003). In Mexico, there are approximately 1,260 species and 170 genera of orchids, and the 50 and 60 % of Mexican orchid species are found in humid montane cloud forests, where these are important floristic components (Hágsater et al. 2005). The epiphyte communities generally present a vertical stratification within phorophytes (Krömer et al. 2007a, Zotz 2007). It has been suggested that this stratification is the result of niche partitioning, what allows the coexistence of different epiphyte species (Wagner et al. 2013). In this context, it has been indicated that the epiphytes have a vertical distribution related to a set of particular microclimatic conditions that vary from the trunk to the inner and outer canopy, determined by the phorophyte architecture and phenology, which introduces substantial variation in growth conditions of epiphytes (Benzing 1990, Richards 1996). Lower and more central crown sections are more humid than the outer portions, and the exposed parts within a tree are usually driest; additionally, the intensity of the light and temperature change at different heights of the trees (Ingram & Nadkarni 1993, Krömer et al. 2007a, Reyes-García et al. 2008, Wagner et al. 2013, de la Rosa-Manzano et al. 2014, Petter et al. 2016). However, different studies indicate that vertical distribution could be related to the dispersal syndromes of the epiphytes (Cascante-Marín et al. 2006, Hietz et al. 2012), while other authors suggest that the greater abundance of an epiphyte in a particular vertical zone of the phorophytes, is determined by diversity of suitable substrates for its establishment and development (Ruíz-Cordova et al. 2014). The inherent structural dependence implies that different host tree species may offer a variety of microenvironments to vascular epiphytes (Woods et al. 2015). In this context, given the particular characteristics of each host species and niche differentiation of epiphytes, some degree of specificity among them and host is expected. Although, the specificity host in the strict sense is not very frequent (Nieder et al. 2000, Kelly et al. 2004, Mehltreter et al. 2005, Laube & Zotz 2006, Alves et al. 2008). Other studies describe the existence of host preference, greater abundance and richness of epiphytes in few host species and host limitation, low abundance of epiphytes in few species of host as a result of limiting factors (ter Steege & Cornelissen 1989, Vergara-Torres et al. 2010). It has been proposed that host preference and limitation of vascular epiphytes species, could be associated with the structural characteristics of phorophytes, including branching patterns, physical and chemical bark characteristics and water absorbing capacity of the bark (Migenis & Ackerman 1993, Bernal et al. 2005, López-Villalobos et al. 2008, Vergara-Torres et al. 2010, Ruíz-Cordova et al. 2014, Cabral et al. 2015). In addition, host preference in orchids may be governed by the distribution of their mycorrhizal symbionts that are needed for seed germination (Arditti 1992, Hietz & Hietz-Seifert 1995, Tupac-Otero et al. 2004). Studies that address the distribution patterns of epiphytic orchids in montane forests examine their specificity toward some phorophytes and additionally their relationship to the structural characteristics of them (Migenis & Ackerman 1993, Tremblay et al. 1998, Bergstrom & Carter 2008, Díaz et al. 2010, Adhikari et al. 2012). The existence of host preference in epiphytic orchids is the determinant in fragmented landscapes such as the montane cloud forest of southern Mexico, because species orchids with host specificity can be more vulnerable to disturbance than generalist species (Tremblay et al. 1998, Colwell et al. 2012, Wagner et al. 2015). Epiphytic orchids frequently display a highly clumped distribution in some host (Hietz & Hietz-Seifert 1995). Such patterns can reflect the varying suitability of particular host tree species or substantial dispersal limitation (Zotz 2016). The objective of this study was to analyze differences in the epiphytic orchid species richness among host species, assess whether tree species differ in their suitability as host of epiphytic orchids, and assess their vertical distribution patterns in fragments of the montane cloud forest in southern Mexico. We tested the following hypotheses: (i) that the epiphytic orchids have preference for larger host trees and non-exfoliating rough bark, while the limiting hosts will be those of smaller size and smooth and exfoliating bark, (ii) there will be fewer individuals in the upper canopy of the host trees because the micro-environmental conditions are more stressful compared to middle and lower parts of host trees. Study area. The study was conducted in two humid montane forests located in the Sierras Triqui-Mixteca (Figure 1), designated as Priority Land Region 126 by the Comisión Nacional para el Conocimiento y Uso de la Biodiversidad (CONABIO), located in Oaxaca state, Mexico. These localities are separated by a distance of 16.2 km. The first site is located in San Andrés Chicahuaxtla (17° 09´ 40´´ N and 97° 49´ 52´´ W; elevation 2,300–2,700 m). The annual mean rainfall is 1,800 mm, and the annual mean temperature is 18 °C (Trejo 2004). In this locality, the montane cloud forests comprise two arboreal strata, one of 15–25 m in height, with Chiranthodendron pentadactylon Larreat, Fraxinus purpusii Brandegee, Liquidambar styraciflua L., Quercus acutifolia Née, and Q. laurina Bonpl., and the other of 8–15 m in height, with Alnus acuminata Kunth, Dendropanax arboreus (L.) Decne. & Planch., Fuchsia arborescens Sims, Garrya laurifolia Hartw. ex Benth., and Symplocos sousae Almeda. The second site is located in San Martín Peras (17° 17´ 42´´ N and 98° 10´ 16´´ W; elevation 2,400–2,800 m). The annual mean rainfall is 1,800 mm, and the annual mean temperature is 18 °C (Trejo 2004). In San Martín Peras, the cloud forest also possesses two tree strata, one of 18–35 m in height, with Quercus laurina, Q. castanea Née, Q. crassifolia Bonpl., and Styrax argenteus C. Presl. The second stratum comprises trees 10–18 m in height, where the species Alnus acuminata, Clethra mexicana DC., Juglans pyriformis Muhl., Litsea glaucescens Kunth, Prunus serotina Ehrh., P. rhamnoides Koehne, and Rhamnus mucronata Schltdl., are prevalent (Ayala-Hernández 2011). These forest fragments are positioned in a matrix of forest and secondary vegetation in different degrees of recovery, pasture, and cropland. 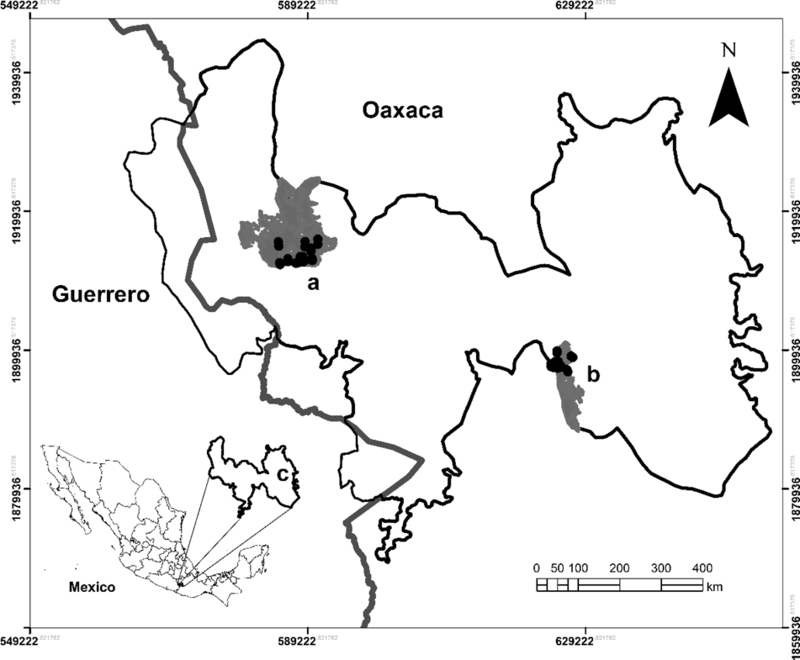 Figure 1 Location of the Sierras Triqui-Mixteca study area and sampling sites in humid montane cloud forest fragments in the state of Oaxaca, Mexico. San Martín Peras (a), San Andrés Chicahuaxtla (b), Sierras Triqui-Mixteca (c). Black dots represent each of the sampled transects. Field work. In each of the selected sites, fragments of the montane cloud forest were identified based on a digital orthophoto at 1:75,000 scale (April 1995, INEGI) as well as by field trips. Forty transects of 2 × 50 m (0.4 ha) (20 in each site) were established. In each transect were tagged and identified at species level by a specialist, all trees with a diameter at a breast height (dbh) ≥ 20 cm. Diameter at a breast height values were measured directly with a tape calibrated to one-millimeter increments and heights were estimated employing a clinometer. Botanical samples were collected from the trees that were not identified in the field, for taxonomic determination using specialized keys and compared with herbarium specimens. The bark textures of the trees were characterized based on the classification proposed by Pennington & Sarukhán (2005). Three categories were considered for this: fissured, with longitudinal grooves and ridges; smooth, lacking peeling or cracks; and exfoliating, with bark flaking into sheets. The number of individuals in each epiphytic orchid species was recorded by tree climbing, applying single-rope techniques combined with observation utilizing binoculars from the ground (Barker 1997, Barker & Sutton 1997). According to Johansson (1974) and Sanford (1968), the orchids with sympodial growth and vegetative propagation that formed colonies were considered as one individual, including vegetative and flowering individuals. Orchid species were identified in-situ utilizing field guides (Hágsater et al. 2005, Salazar et al. 2006). When it was not possible, plants were collected for taxonomic determination later on. All the specimens were compared against the collections deposited at the herbaria FEZA and MEXU. Voucher specimens of epiphytic orchids and trees were deposited in the Herbarium of the Facultad de Estudios Superiores Zaragoza, Universidad Nacional Autónoma de México (FEZA, UNAM). The vertical distribution pattern of epiphytic orchids in the host, was evaluated based on the Johansson (1974) approach, dividing host into five zones: basal portion of trunk (ZI, 0-2 m high), from 2 m up to the first ramification (ZII), basal part of the large branches, up to the second ramifications (about a third of total branch length) (ZIII), secondary and tertiary ramifications (ZIV), and the external part of the crown (ZV). These zones, utilized frequently in epiphyte research, are a useful approach for the analysis of vertical richness of epiphyte communities (Gradstein et al. 2003). To analyze the basal area of tree species were made box-and-whisker diagrams since it allows an adequate graphic data representation. Variations in the BA of trees were compared employing a one-way ANOVA. Multiple comparisons among the BA means were drawn utilizing the post hoc Duncan multiple range test. Was analyzed the normality of the BA data with the Kolmogorov-Smirnov test and the homogeneity of the variances with the Levene test. All analyzes were carried out in SPSS software trial version 15.0 (SPSS Inc., USA). The differences registered in the epiphytic orchid richness and the type of bark of the trees analyzed, were quantified using a one-way ANOVA, followed by multiple comparison tests between the means of the richness (Tukey-Kramer HSD tests). To determine the epiphyte-host association, an χ2 test was performed. A contingency table of host (columns) and epiphytic orchids (rows) was structured. The categories of the table were determined by the number of individuals in the epiphytic orchid species observed for each host. The number of individuals of epiphytic orchids for each host was considered as the observed frequency in the χ2 analysis. When the result of the contingency table was significant (P < 0.05), a standardized residual analysis was performed to isolate the observed values that differed from the expected values (Haberman 1973, Bernal et al. 2005). A tree was considered as a preferred host, performance higher than expected, when the standardized residual value was > 2, with a higher-than-expected observed epiphyte abundance. As a limiting host, performance lower than expected, the standardized residual value was < -2, with an observed abundance that was lower than expected. As neutral host (performance did not differ from expectancy), the value of the standardized residual was ≤ 2 and ≥ -2, with an observed abundance equal to that expected (Vergara-Torres et al. 2010). Based on the results of the standardized residual analysis, epiphyte–host association was considered preferred when five or more species of epiphytic orchids were recorded, limiting host when less than five orchid species were recorded, and neutral when the observed and expected frequency was ≥ five (Vergara-Torres et al. 2010). Vertical distributions patterns. Differences in the richness of epiphytic orchids in the five zones were quantified through the one-way ANOVA, followed by multiple comparisons test among epiphytic orchids richness mean in the five zones (Tukey-Kramer HSD tests). According to the record of epiphytic orchids, defined as the presence of species orchids in a given height zone, in the five vertical zones, they were classified in two ecological types (Acebey et al. 2003, Krömer & Kessler 2006, Krömer et al. 2007a): generalists, found in three or more zones; and specialists, found in only two zones or in three continuous zones. Specialists were classified as canopy epiphytes when more than 90 % of the individuals of each species were present in ZII to ZV, and trunk epiphytes, with the same percentage present in ZI and ZII. To ascertain whether the epiphytic orchid specialists were trunk or canopy species, 2 × 2 contingency tables were utilized applying Fisher’s exact test (Zar 1996). The categories of the table were determined based on the presence or absence of each orchid species on the host trees. The patterns of vertical distribution of the epiphytic species of orchids in the five zones, as well as the ecological types, were compared employing a G test of goodness-of-fit. Richness of trees and epiphytic orchids. 363 trees were recorded, belonging to 16 families, 14 genera, and 20 species, with an average dbh (± SE) of 62.4 ± 39.2 cm and with an average height (± SE) of 15.3 ± 4.6 m (Table 1). The total number of epiphytic orchid individuals recorded was 4,204, on 334 host, corresponding to 11 genera and 23 species. The species of epiphytic orchids with the highest number of individuals were Rhynchostele maculata (La Llave & Lex.) Soto Arenas & Salazar, Artorima erubescens (Lindl.) Dressler & G.E. Pollard, Maxillaria rhombea Lindl., and Prosthechea hastata (Lindl.) W.E. Higgins (Table 2). On average (± standard error), 12 (± 27) individuals and 1 (± 1) epiphytic orchids species were recorded per host tree. Table 1 Host species, host individuals number (HIP) and orchid richness (OR), observed in 0.4 ha of a montane cloud forest in southern Mexico. Table 2 Individuals number of epiphytic orchids recorded in 40 transects (0.4 ha) in 20 montane cloud forest fragments in southern Mexico. Host size. Significant differences were observed in the basal area between the tree species analyzed (ANOVA; F19,342 = 5.53, P < 0.0001). The trees with largest size (i.e., basal area) were the Chiranthodendron pentadactylon (484 ± 79 cm2) (mean ± SE), Prunus rhamnoides (488 ± 56 cm2) and Quercus glabrescens Benth. (477 ± 21 cm2), whereas the smallest ones were the Clethra mexicana (130 ± 121 cm2), Conostegia xalapensis D. Don (156 ± 121 cm2), and Styrax argenteus (198 ± 93 cm2) (Figure 2). The epiphytic orchid richness displayed differences among host individuals (ANCOVA; F 1,354 = 4.93, P < 0.0001) and positively correlated with the size of them (Spearman r-value = 0.30, P < 0.0001; Figure 3). Figure 2 Basal area of tree species recorded in 20 montane cloud forests in Oaxaca, southern Mexico. Lines inside the box are means, boxes are one standard error and dispersion lines 95 % confidence intervals. Figure 3 Spearman rank correlation showing the relationship between richness of epiphytic orchids with tree size in 20 montane cloud forest fragments in Oaxaca, southern Mexico (Spearman r-value = 0.30, P < 0.0001). F2,66 = 3.43, P = 0.038) of epiphytic orchids between the types of tree bark analyzed were observed. The highest species richness and number of epiphytic orchid individuals were recorded in host trees having fissured bark (23 orchid species), the lowest richness in host trees having smooth bark (16 orchid species) and exfoliants (11 orchids species). Host preference of epiphytic orchids. The outcomes of the contingency table analysis indicated that the distribution of epiphytic orchids in host is not homogeneous with regard to the host identity (χ2 = 9883.1, P < 0.0001). The analysis of standardized residuals demonstrated that Artorima erubescens was significantly more abundant than expected by chance on seven host species, Epidendrum greenwoodii Hágsater, Prosthechea hastata, and Rhynchostele candidula (Rchb. f.) Soto Arenas & Salazar on five phorophytes, Rhynchostele candidula was significantly more abundant than expected by random on four host species, whereas Isochilus bracteatus (Lex.) Salazar & Soto Arenas ex Espejo & López-Ferr., Lepanthes nagelii Salazar & Soto Arenas, L. brachystele Salazar & Soto Arenas, Oncidium unguiculatum Lindl., Prosthechea ghiesbreghtiana (A. Rich. & Galeotti) W.E. Higgins, and Stelis sotoarenasii Solano were only recorded on Quercus laurina. Epidendrum camposii Hágsater and Lepanthes greenwoodii Salazar & Soto Arenas was significantly more abundant than expected by random in Chiranthodendron pentadactylon, and Lepanthes nagelii in Alnus firmifolia Fernald (Table 3). Table 3 Epiphytic orchids individuals (fo), expected individuals number (ft) and standardized residual (rs), recorded in 20 host trees species in a cloud forest in southern Mexico. In bold significant values are shown (P < 0.05). In this study, not a single neutral host was recorded. There were no significant differences observed in the species richness of epiphytic orchids between limiting hosts and preferred hosts (ANOVA, F1, 38 = 0.6; P = 0.79). However, some species of epiphytic orchids were more frequent in specific host (Fisher´s exact test, P = 0.014). Over five epiphytic orchid species were more frequent in Arbutus xalapensis Kunth, Chiranthodendron pentadactylon and Quercus laurina, whereas for Alnus firmifolia, Clethra kenoyeri Lundell, Clethra mexicana, Prunus rhamnoides and Quercus rugosa Née, the value of the standardized residuals was less than two and the observed frequency was lower than expected by chance in more than five epiphytic orchid species (Table 4). Abies guatemalensis Rehder, Buddleja cordata Kunth, Conostegia xalapensis D. Don., Litsea glaucescens, Oreopanax xalapensis Decne & Planch, Prunus brachybotrya Zucc., Senecio cobanensis J. M. Coult, Symplocos sousae, Styrax argenteus and Ternstroemia lineata DC., were considered indeterminate host, because the residual analysis did not reflect a consistent pattern between the number of orchid species with lower and higher abundance than expected by chance (P > 0.05) (Table 4). Table 4 Characteristics of host species (dbh ≥ 20 cm), mean basal area (standard error), mean height, types bark, mean epiphytic orchid species and individuals, recorded in cloud forest located in southern Mexico. 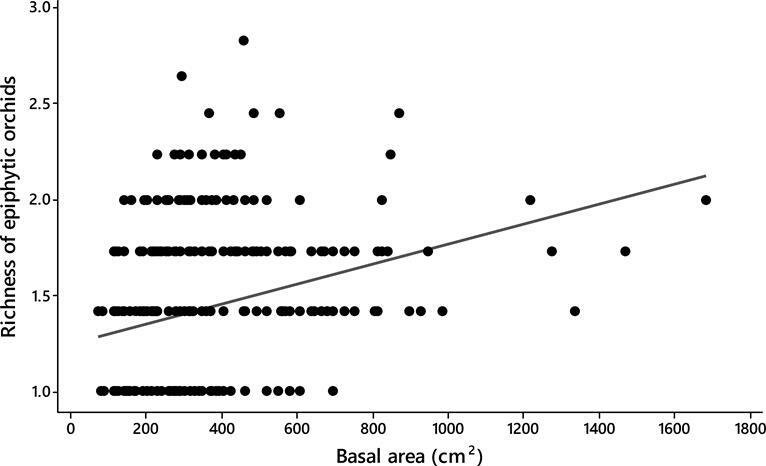 Different letters indicate statistically significant differences between mean basal area. Duncan multiple range test (P < 0.05). Means with common letter are not significantly different (P > 0.05). Vertical distribution. The richness of epiphytic orchids was different in the vertical zones (ANOVA; F4,110 = 15.7, P = 0.0001). The highest richness was recorded in ZII and ZIII, with 23 and 21 species of epiphytic orchids respectively. The lowest richness occurred in ZI, ZV and ZIV, with five, seven and nine species respectively (Figure 4). 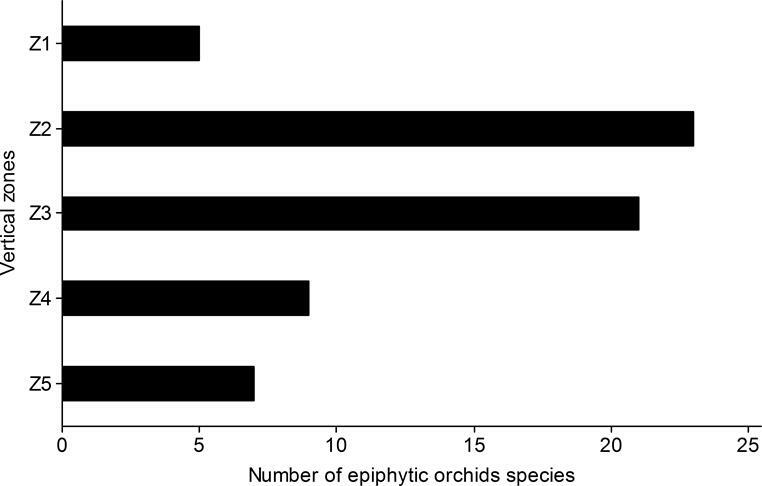 Figure 4 Number of epiphytic orchid species in five vertical zones (ZI-ZV) of host trees individuals in 20 montane cloud forests in Oaxaca, southern Mexico. Based on the presence of a particular species in each vertical zone of host, we obtained 504 records of epiphytic orchids, of which 336 were quantified in ZIII, ZIV, and ZV and 168 in ZI and ZII (G-test = 38.8; P = 0.011). 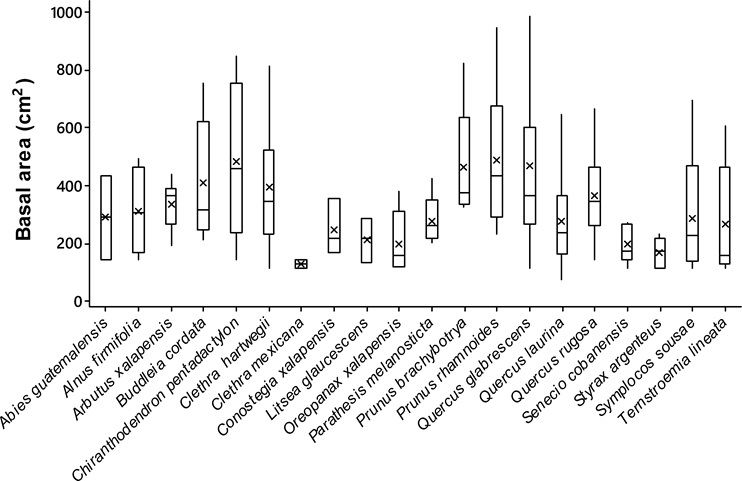 It was not possible to identify a pattern of vertical distribution for 65 % of the sampled plants due to the lack of records obtained pertaining to this set of species (Fisher´s exact test, P > 0.05) (Table 5). For several species, it was possible to observe significant differences among these zones (G-test, P < 0.05); Epidendrum camposii, E. eximium L.O. Williams E. greenwodii, and Prosthechea hastata were more prevalent in the primary branches (ZIII). These species are considered as canopy epiphytes. In contrast, Anathallis scariosa (Lex.) Pridgeon & M.W. Chase, Artorima erubescens, Maxillaria rhombea and Rhynchostele maculata were considered as generalists, because they were observed both on the trunk and in the canopy (ZII to ZIV) (Table 5). Table 5 Number of epiphytic orchid individuals quantified in five vertical zones (ZI-ZV) in 334 host trees analyzed in a cloud forest of southern Mexico. The species of epiphytic orchids were classified into three ecological types: generalist = ge, canopy epiphyte = ce, trunk epiphyte = te. P-values of the two-sided Fisher’s exact test are shown for taxa with significant habitat preferences (P < 0.05). Host characteristics. A positive linear correlation between the species richness and host size was observed. This relationship has been reported in vascular epiphytes in various studies (Flores-Palacios & García-Franco 2006, Zotz & Schultz 2008, Hirata et al. 2009, Moorhead et al. 2010, Toledo-Aceves et al. 2017). The size of the host impacts the richness and abundance of the epiphytes; this increases the establishment area and the diversity in the microhabitats (Zotz & Vollrath 2003, Woods et al. 2015). Long-term habitat stability, in addition to size, can be a determining factor in the establishment of epiphytes (Laube & Zotz 2003). Larger trees enable colonization of epiphytes for a longer time as compared to smaller and generally younger trees (Krömer et al. 2007b). These trees can host additional species that may not find adequate growth conditions in younger trees (Zotz & Vollrath 2003, Burns & Dawson 2005, Krömer et al. 2007b, Bartels & Chen 2012). However, smaller trees may be suitable for certain species (Flores-Palacios & García-Franco 2006). For example, Catling et al. (1986) observed four orchid species distributed over branches less than 10 cm long and demonstrated that Lepanthes caritensis prefers trees with dbh less than 20 cm. The small biomass of twig epiphytes enables them to colonize this microhabitat and utilize the space better (Chase 1987, Gravendeel et al. 2004). When comparing the orchid species richness among bark types, we observed that the highest richness was recorded on trees possessing fissured bark. Other studies have also indicated that trees with fissured bark can improve water absorption and increase the rates of epiphyte establishment, because these characteristics prevent the seeds of the epiphytes from easily separating (Tupac-Otero et al. 2007, Cascante-Marín et al. 2009, Wagner et al. 2015). In contrast, host with smooth and exfoliant bark present low epiphyte richness, which may be related to increased seed mortality and the limited establishment of this group of plants due to unstable substrates (Zimmerman & Olmsted 1992, López-Villalobos et al. 2008, Woods et al. 2015). However, in the present study, we observed that Arbutus xalapensis, it is a tree with smooth and exfoliating bark, are suitable host to five species of epiphytic orchids. This association may be related to the dynamics of the substrate in this host where these epiphytes are established, which depends upon the tree size and age (Zotz & Vollrath 2003, López-Villalobos et al. 2008, Woods et al. 2015). The host species have a combination of characteristics; therefore, it is difficult to indicate which of them determine its suitability as a host. Other bark characteristics, such as chemical composition and water and nutrient retaining capacity, which were not considered in the study, could be determinants in the establishment of this plant group (Callaway et al. 2002, Tupac-Otero et al. 2007, Hirata et al. 2009). Cardelús et al. (2009) displayed that the chemical properties of bark vary significantly among host species, while Valencia-Díaz et al. (2010) indicate the possibility that a combination of compounds in the bark of host inhibits the germination of epiphyte seedlings. Host preference of epiphytic orchids. Tree host specificity in orchids has seldom been observed (Catling et al. 1986, Ackerman et al. 1989, Zimmerman & Olmstead 1992, Migenis & Ackerman 1993). The orchids registered in this study have no preference for certain host trees species. However, the highest richness was recorded on Quercus laurina, Chiranthodendron pentadactylon, and Arbutus xalapensis, whereas lower richness was observed in Alnus firmifolia, Clethra kenoyeri, Clethra mexicana, Prunus rhamnoides, and Quercus rugosa. This pattern is consistent with other studies where epiphytic orchids were significantly more abundant in certain host species and with previous studies that analyzed epiphyte assemblages (Ackerman et al. 1989, Catling & Lefkovitch 1989, Zimmerman & Olmstead 1992). According to Toledo-Aceves et al. (2017), not all epiphytic species exhibit the same level of neutrality or host preferences. Wagner et al. (2015) indicate that a species of epiphyte can be established on any species of potential host or they can colonize those with particular structural characteristics. Although epiphytic orchids were discovered on all hosts, some species of orchids represented by a few individuals were recorded only on Quercus laurina (e.g., Isochilus bracteatus, Lepanthes brachystele, Oncidium unguiculatum, and Stelis sotoarenasii). This distribution pattern can be associated with the large number of individuals of Q. laurina in the study region. Trees of this genus are also abundant in the cloud forests of central Veracruz and are generally regarded as preferred host (Hietz & Hietz-Seifert 1995). The bark of this host species is thick and fissured, which may facilitate the anchoring of seeds and possibly increase the capacity of the substrate to retain humidity. However, in the present study, Quercus rugosa was considered a limiting host to more than five epiphytic orchid species, probably because not all oak species displayed this pattern and such interspecific differences in host specificity can be the outcome of a range of tree attributes such as bark chemistry, architecture, and phenology of host species (Wagner et al. 2015, Toledo-Aceves et al. 2017). Although a few orchids are potentially host restricted, dependence on the mycorrhizal fungi for germination is an important element of orchid biology and may be restrictive in the distribution of orchids (Arditti 1992). Vertical distribution. In this study, the highest species numbers of epiphytic orchids were found in ZII and ZIII, whereas the lowest richness values were found in ZI, ZIV and ZV. These results are in accordance with those obtained by Acebey & Krömer (2001) and Arévalo & Betancur (2006) in a tropical forest of South America. However, other studies, in similar settings of vegetation, record the highest epiphytic orchid richness in ZIII and ZIV (Freiberg 1996, Werner et al. 2005, Krömer et al. 2007a). The variations in the richness of epiphytic orchids quantified in vertical areas studied can be related to the structural characteristics of the host. Gradstein et al. (2003) and Krömer et al. (2007b) suggest that variations in the epiphyte diversity within the vertical zones are determined by the height and structure of the canopy, which moderate the intensity and direction of the light received as well as the atmospheric humidity, temperature, and nutrient availability. In the montane forests, the constant presence of humidity can be favorable for the specialization of microhabitats of epiphytic plants (Gentry & Dodson 1987). The vertical distribution pattern observed in this study can be associated with the accumulation of organic substrate on the host. Different studies have indicated that organic matter accumulated on host could influence the stability of the substrate and, therefore, favor the establishment of epiphytes (Ingram & Nadkarni 1993, Tremblay et al. 1998, Ruíz-Cordova et al. 2014). The accumulation of organic substrate is larger in microenvironmental conditions with lesser availability of light and high level of humidity (Mota de Oliveira et al. 2009, Gil-Novoa & Morales-Puentes 2014). This organic matter accumulated on the trunk and primary branches of the host can provide constant humidity, which is a restricting factor for epiphytic plants, particularly during the germination stages (Pypker et al. 2006, Scheffknecht et al. 2010, Mondragón et al. 2015). Other studies propose that the presence of epiphytic bryophytes facilitates the establishment and survival of vascular epiphytes (Tremblay et al. 1998, Zotz & Vollrath 2003). Bryophytes may impact epiphyte establishment by enhancing anchorage for seeds and provide a more reliable source of water supply during germination, particularly in tree species having smooth bark (Wyse & Burns 2011), additionally reducing drought and promoting the formation of mycorrhizae in orchids (Zotz et al. 2001, Osorio-Gil et al. 2008). At the species level, significant differences were observed between vertical zones in only eight species of epiphytic orchids. Among these, Epidendrum greenwodii, E. eximium, E. camposii, and Prosthechea hastata are regarded as canopy epiphytes, whereas Anathallis scariosa, Artorima erubescens, Maxillaria rhombea, and Rhynchostele maculata are considered as generalists. Among the generalist species, only Anathallis scariosa and Artorima erubescens were frequently observed in ZV. Some epiphytic species are habituated to high humidity zones (ZI-III) with less radiation, while others occur on the branches of ZIV–V, which are more exposed to microclimatic changes (Kelly 1985, Hietz & Hietz-Seifert 1995, Krömer et al. 2007a). Artorima erubescens is frequently found in canopy trees of cloud forests between 2,400 – 3,100 m of altitude, where few orchid species can find establishment, probably due to the low temperatures; in particular, the regular occurrence of frost conditions are restrictive to epiphyte diversity in the highlands (Krömer et al. 2005, Cardelús et al. 2006). Solano (1993) indicates that some species of epiphytic orchids from the genera Lepanthes and Stelis have an affinity for sites in which the atmospheric humidity is high and incident light is low throughout the year, with high habitat specificity. The epiphyte taxa independently evolved a variety of different morphological and physiological characteristics (e.g., velamen radicum, pseudobulbs, succulence, and crassulacean acid metabolism) in order to meet the nutrient and water limitation. This high functional variability can be associated with the ecological amplitude, increasing the vertical distribution of the epiphytes in the host trees (Sides et al. 2014, Petter et al. 2016). In conclusion, this study documents some habitat specialization among the epiphytic orchids of the studied cloud forest, since these can be considered as epiphytes of canopy or trunk, each with their respective morphophysiological adaptations. Epiphytic orchids display no host specificity; these were present on all inventoried trees species in this study, although some species of orchids were more frequent in certain host, suggesting that certain tree species might be preferred hosts than others. Larger trees contain greater richness of epiphytic orchids, because they offer better conditions for their establishment, provide a great diversity of microhabitats, greater time and area for epiphytic colonization events. The texture of the bark is a relevant factor in the host preference and in the hosts with smooth bark, the presence of epiphytic orchids depends on the accumulation of organic matter. Changes in the composition of the tree community in the cloud forest studied or the dominance of certain tree species in secondary forests could affect the epiphytic orchid assemblages. Future research might relate the functional features of the host, as well as the microclimate they provide, with the distribution patterns of epiphytic orchids. These approaches will allow determining which mechanisms cause the specificity or preference of hosts of this group of plants. The authors thank the Dirección General de Asuntos del Personal Académico, Universidad Nacional Autónoma de México for financial support (PAPIIT IN225210-3 agreement). The first author thanks the Consejo Nacional de Ciencia y Tecnología for the scholarship during his graduate studies (fellow number: 165051) and the Posgrado en Ciencias Biológicas, UNAM, for the training received during his studies. During the research development, Irma Trejo Vázquez contributed with methodology recommendations. Gerardo Salazar Chávez identified the orchid species. * Corresponding author: Eloy Solano, e-mail: solacael@yahoo.com.mx. Author contributions: Ezequiel Hernández Pérez, Eloy Solano and Ramiro Ríos Gómez conceived the ideas, designed methodology, collected the data and led the writing of the manuscript. All authors analyzed the data, contributed critically to the drafts and gave final approval for publication.